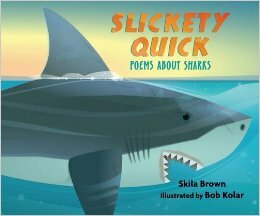 SLICKETY QUICK: POEMS ABOUT SHARKS by Skila Brown is fun collection of poems about sharks large and small, slow and quick! Some of these sharks I've never heard of before (cookie-cutter shark?). The poems are as varied as the sharks; the author does a good job of matching the poem to the nature of the shark it's describing. The illustrations are eye-catching. The colors remind me of my frequent visits to the aquarium at my local zoo. This is a great book for any fan of sharks or poetry!